A narrow stream of water was pouring onto the wheel from a small spout above it and spraying off of it and onto Ryan’s apron. Without water to cool the wheel, heat from friction could have cracked the stone, and powdered amethyst would have been flying everywhere. 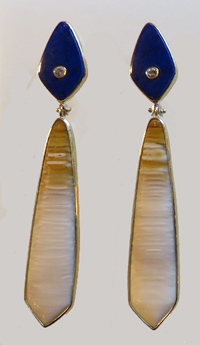 Ryan Gardner created these earrings of fossilized palm wood and lapis lazuli inlaid with small diamonds. Ryan does both lapidary work and metalsmithing. Late last year I wrote about the work of metalsmith Jennie Milner, a friend of Ryan. “Our techniques for metalsmithing are very similar,” Ryan told me. We agreed to focus on the lapidary side of his work during my visit. I had seen his jewelry at the “Gathering of the Guilds” in Golden late in April. The beautiful color and shape of his stones and the unique way he combined them had spurred me to drive the length of the Front Range to visit him in the studio he shares with Michael Boyd, known internationally for his jewelry and art objects. Ryan apprenticed under Michael after graduating with a Bachelor of Fine Arts degree from Ohio’s Bowling Green State University five years ago. Now he works as Michael’s assistant, helping him at workshops around the country; but he also maintains his own studio space. He sells his jewelry to galleries under the name Ryan Gardner Designs. Grinding is the seemingly incongruous term for shaping and polishing gemstones. What kind of material can grind stones? Diamonds. Diamonds ground to dust coat six wheels mounted in a row on the grinding machine where Ryan shapes gemstones. The first three wheels are made of steel and work like sandpaper of 80, 220, and 280 grit respectively – except that sandpaper can’t shape stone. Grit refers to how many abrasive particles fit onto a square inch of surface area but means nothing about how hard the particles are. 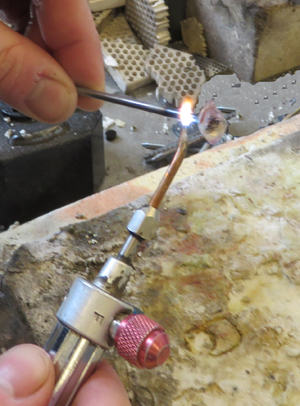 In seconds, the heat of this torch will release the small amethyst from the end of the nail where it was super glued. Mounting stone on a nail is a technique used by Ryan Gardner to hold the stone during grinding. The lower the number, the more coarse the grit. Ryan starts with the lowest number and moves to the next steel wheel with a higher number as the stone comes closer and closer to the desired shape. The next three wheels on the machine are made of foam coated with resin and solidly set with diamond dust. This is where Ryan polishes stone with grit of 600, then 1,200, then 3,000 as he moves from wheel to wheel. The polishing process doesn’t end there. Ryan coats a small felt wheel with a compound that applies an even finer grit to the gemstone. The grade of grit for the final polish depends on the stone and what he wants to achieve. The finest grit that he uses has the equivalent of 50,000 diamond particles per square inch. Ryan poured into his hand a small amount of the ground diamond powder that he mixes with Vaseline to polish fine detail of a stone. The powder looked like gray flour. It seemed like a sad end for diamonds until I learned that less than 20 percent of mined diamonds have the quality to become part of fine jewelry. The other 80 percent are sold for industrial purposes. Ryan’s creations begin with the stone in mind. “The stone tells me what it wants to be,” he said. Sometimes a gemstone has an unusual characteristic on one side that begs to be shown off. 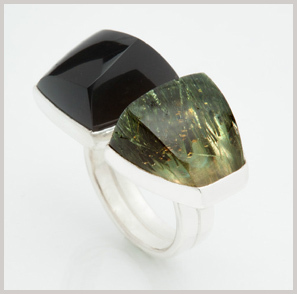 Ryan may respond by shaping the stone asymmetrically, as in the ring of smoky quartz and clear quartz with green inclusions pictured here. In the photo below, Ryan is working with a flat piece of agate that has an exceptional color pattern in one area. He uses his trim saw to cut out that section. The blade of the trim saw looks as sharp as a blade in a woodworking shop — the kind that can cut off a fingertip in a flash. Ryan Gardner uses a trip saw to cut out a section of agate that has a color pattern he wants to work with. Finely ground diamonds cover the blade’s cutting edge. Like the grinding wheels, the blade of the trim saw is coated with finely ground diamonds. Once he isolates the section of stone that has “spoken” to him, he can begin the grinding process. Recently Ryan has begun experimenting with mother of pearl veneer. Glued to the underside of transparent gemstones like aquamarine, the veneer adds an intriguing pattern to the stone when viewed from above. 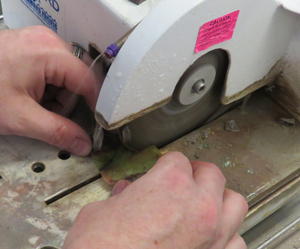 Ryan attaches the veneer with an archival-quality epoxy that museums use to repair glass art. The pattern in fossilized dinosaur bones adds design interest to some of the handmade jewelry by Ryan Gardner. They may be combined with fine gemstones in earrings, necklaces, and rings. Patterned stone isn’t new to his work. 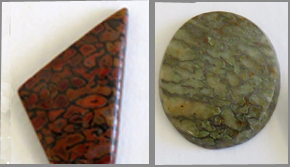 Ryan has already enjoyed using fossilized dinosaur bone like the pieces picture here, often placing them side-by-side with gemstones. Enjoy browsing through his work by scrolling down his photo album on Facebook and by visiting his website. Galleries carrying his work include Cultureclash in Salida, Colorado, and Karen Melfi Collection in Santa Fe, New Mexico.